Ronald Reagan was a natural leader, well-remembered not just for his political leadership, but also for his warmth, kindness, dignity, and optimism. There's a lot kids can learn from Reagan, about our country and about being good leaders and good people. The Remarkable Ronald Reagan: Cowboy and Commander in Chief is a fun, colorful look at his life, from his humble beginnings as the son of a shoe salesman, to his years as a Hollywood actor, his service in WWII, his work as California governor, and the culmination of his political career in the Oval Office. 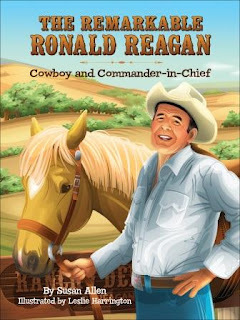 There's plenty that even adults can learn as they read along with their kids, including Reagan's efforts to stand up against the threat of communism and his powerful faith in God. The Remarkable Ronald Reagan is a treat for the entire family. I'll admit it--I was a little apprehensive about reading this to my daughter. We have read a number of biographies together, but no subject has been as recent as Ronald Reagan. Even nearly a decade after his life, he is still a polarizing character in the American psyche. Frankly, I was afraid that this book might be more of an indoctrination attempt than just a good old kid's book. This book is said to be appropriate for children ages 5 to 8. Honestly, I think closer to the 8 side of that range would be ideal. My daughter is 4 and half, but I read to her at a higher age-level. While she did think starring in Bedtime for Bonzo with a chimpanzee was absolutely hilarious, she didn't seem very interested in the rest of the book. To be sure, Allen crams a lot of information in this book--maybe much more than she needs to. Because of that, it is best suited for slightly older children with a longer attention span. This review is part of blog tour by TLC Books tours. I received a copy of the book to read and review, but all opinions are mine, and mine alone. I received no other compensation for this review. Want another opinion? Check out some of the other stops on this tour! I normally list all the blogs participating, but this is an exceptionally large tour. You can access the complete list here. Is it awful that I'm giggling and giggling over that cover? ;) Hee Hee! I know! The illustrations were, well, not to my liking, but my daughter didn't really seem to mind them so I didn't address them in my review. Luckily, it seems the only person who will be regularly reading this book in our house is my husband! Thanks for the insight! We are reading The Little House Series to our 4 year old and are always on the lookout for more. ARE there children's picture books about Hitler or Stalin?! I'm somewhat horrified by the thought ... (although it is also strangely funny).